Here is a brief overview of what President’s Trump’s budget would mean for housing, community development, environment, and transportation programs. President Trump’s budget requests $40.7 billion in gross discretionary funding for the U.S. Department of Housing and Urban Development (HUD) — $6.2 billion (or 13.2 percent) less than fiscal year 2017 spending levels. The budget emphasizes government efficiency, a greater role for state and local authorities, and the importance of private investment in public housing. Specifically, President Trump’s budget proposes completely eliminating funding for HUD’s Choice Neighborhoods program, which provides support for struggling neighborhoods and aid for community revitalization; the Community Development Block Grant program, which provides communities with resources to address a wide range of development needs; the Indian Community Development Block Grant program, which provides aid to Indian tribal communities and Alaska Native Villages; the HOME Investment Partnerships program, which provides block grants to states and localities to expand affordable housing; the Self Help and Assisted Homeownership Opportunity program, which provides competitive funds to assist low-income families in building their own homes using a “sweat equity” or self-help model; and the Section 4 Capacity Building for Community Development and Affordable Housing program which enhances the capacity and ability of community development corporations and community housing development organizations to carry out community development and affordable housing activities that benefit low-income people. President Trump’s budget proposes deep cuts to programs at the U.S. Department of Agriculture (USDA), which many rural residents and farmers depend on. The budget requests $17.9 billion in funding for USDA, a $4.7 billion (or 21 percent) decrease from the 2017 annualized continuing resolution level. The president’s budget proposes completely eliminating funding for USDA’s Rural Business and Cooperative Service program, which support rural business development and job training; the Rural Water and Waste Disposal program, which provides funding for drinking water and wastewater treatment plants as well as solid waste disposal and storm water drainage to rural households and businesses; and the Single Family Housing Direct Loans program, which subsidizes mortgage payments for low-income rural families. President Trump’s budget also seeks to reduce rural development salaries and expenses by $53 million. The President’s 2018 budget requests $12.1 billion in discretionary resources for the Department of the Treasury’s domestic programs — a $519 million (or 4.1 percent) decrease from the 2017 annualized continuing resolution level. The budget eliminates funding for Community Development Financial Institutions Fund grants, which provide access to financial products and services in some of the nation’s most distressed communities. The budget also reduces funding by $21 million to the Troubled Asset Relief Program, which helped prevent avoidable foreclosures in the wake of the 2008 financial crisis. The President’s budget requests $5.7 billion in funding for the Environmental Protection Agency (EPA) — a $2.6 billion (or 31 percent) decrease from the 2017 annualized continuing resolution level. The cuts include the elimination of more than 50 EPA programs as well as cuts to grants and staff. Most notable is a $330 million cut to the Hazardous Substance Superfund Account, which was funded at $762 million in FY2017. This program is used to clean up hazardous waste sites. The budget also reduces funding for Categorical Grants—which help states meet federal environmental requirements for water, air, and waste—by $482 million. The budget allocates $2.3 billion for State Revolving Funds, and $20 million for the Water Infrastructure Finance and Innovation Act program, which provides subsidies for water projects. The President’s budget requests a 13 percent cut to the U.S. Department of Transportation (USDOT) discretionary budget, to $16.2 billion. The budget would end the TIGER competitive grant program, phase out New Starts and Small Starts funding, and severely cut funding for long-distance Amtrak service. Combined with the elimination of numerous other programs, these cuts would put even more pressure on already overstretched local governments. The proposed budget also includes a new line item for spending $200 billion on infrastructure over 10 years, which is intended to incentivize an additional $800 billion in investment from the private sector, state governments, and local governments. Most of that $200 billion would be spent in years 2 through 8 of the 10-year timeframe, leaving approximately $5 billion in proposed spending for FY 2018. The President’s budget proposes cutting $253 million from the Economic Development Administration and the Minority Business Development Agency, two programs that provide small to medium-sized minority business enterprises with a variety of business assistance services. This proposed cut, if voted for, would be a huge hit to small business development. The President’s budget request would eliminate the Department of Health and Human Services’ Community Services Block Grant program, which provides funds to alleviate the causes and conditions of poverty in communities. 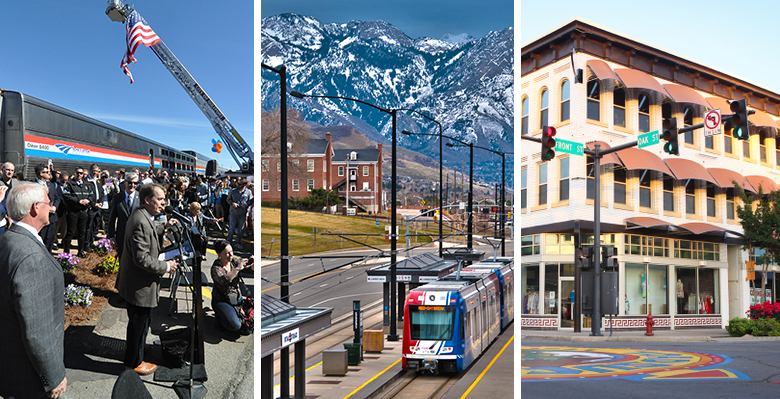 The President’s budget request would eliminate funding for the National Endowment for the Arts, which provides funding for the arts and placemaking programs including the Citizen’s Institute on Rural Design—which offers funding to communities with populations of 50,000 or less to host community design workshops–and the Mayor’s Institute on City Design, which brings together mayors and design experts to solve the most critical planning and design challenges. As proposed, the President’s FY 2018 budget represents the largest, most draconian cuts to federal attainable housing, public transportation, and community development programs we have seen in recent history. We hope Congress takes action to fight this budget, and instead develop a plan for responsibly investing in Americans and their communities.